While on my way to Nezu and waiting to cross a street, two rushing, flexing Lambourghinis (Dark purple and brilliant cobalt blue) blazed past, and a man walking a poodle with a Fendi shirt and a Louis Vuitton scarf trotted up next to me, waiting for the Lambourghinis to race away and for the crosswalk to open up. Pangs of simultaneous fancy car and fancy Fendi poodle envy struck me, and I felt some kind of guilt at not lavishing enough attention on my own poodle back at home. Ginza, in effect, floored me as much as Roppongi, where it felt like some alternate-reality product between Aspen and the ever-chrome River Oaks in Houston. It’s like Beverly Hills on eleven. Ginza was also the only neighborhood in Japan that I visited where I saw people running and exercising. I’m not sure why this was - maybe the other districts were more dedicated to fashion, shopping, and museums - but in Ginza, I found myself shuffling out of the way several times for speedy runners with extremely cool-looking shoes. By the time I had reached Nezu, I was exhausted from watching Lambourghini races and bedazzled by Fendi poodles. Even cushioned by Newton Running shoes, my feet felt flat and used up. Yet, I didn’t think about my feet at all though as I walked through Nezu gardens. Thinking didn’t happen. Visitors had placed 1 and 5 yen coins atop Buddha’s head and hands. I found myself wondering who had placed the coins, and who eventually moves them. It seemed like a task that would be conducted by a spirit in the earliest morning hours. Many wells and bridgesides at Nezu gardens glitter with yen donations from local and international patrons. The Nezu museum contained many art treasures and I was lucky to see an exhibit dedicated entirely to lotuses in Buddhist art. While no photos were allowed of the museum, the gardens allowed cameras. Yet, photos barely do this place justice. The peace and quiet of Nezu gardens that doesn’t fully make it through in these photos, at least. Though struck through with a webbed grid of metro rails and roads, all of Tokyo only murmurs. Like a slumbering, horizonless giant, it’s a surprisingly quiet city where you could hear a cherry blossom petal fall to the ground. 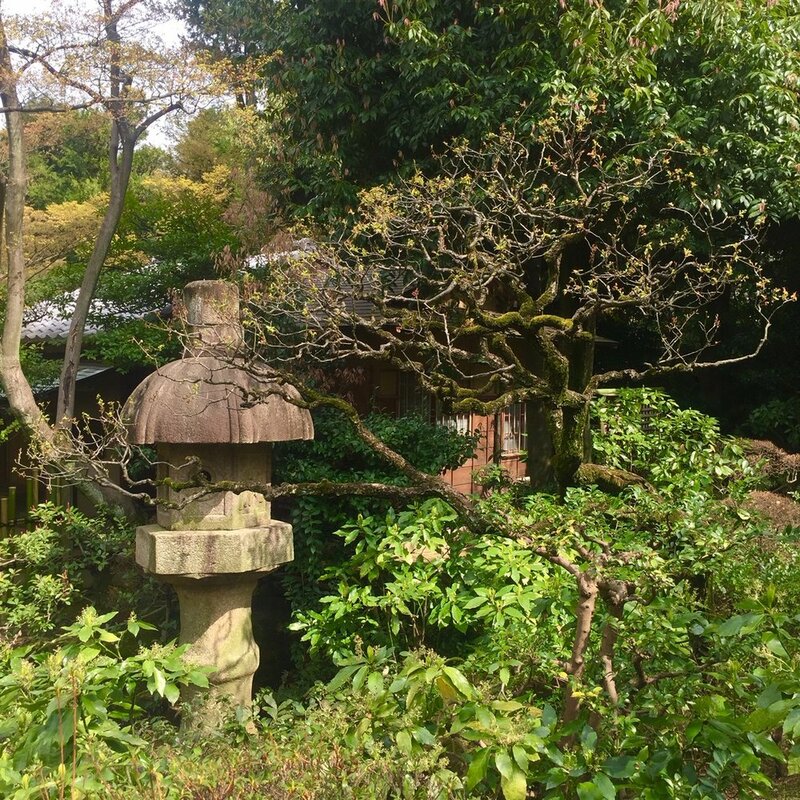 Walled off from an already-hushed metropolitan city, Nezu gardens are quiet within quiet. Thundering Lambourghinis and Fendi-clad poodles might as well be happening on another planet.